The Norfolk Southern (NS) railroad is one of two large rail transportation systems in the eastern United States. The road covers from Michigan and the northern states south to the edge of Florida and west to the Mississippi River. NS enters Michigan from two main directions - a double track main line north from Toledo, and a single track line which leaves the NS main line at Butler, Indiana and heads northeast through Montpelier, Ohio, Adrian and Romulus. Both of these lines terminate in the Detroit terminal area. 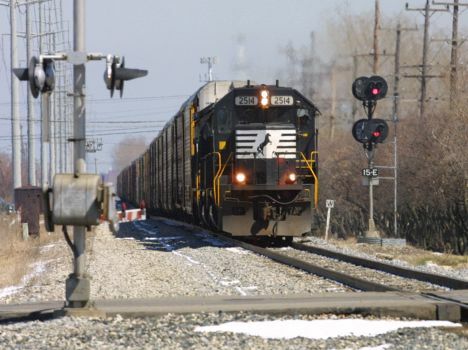 NS also handles freight operations on a third line which was recently sold to the State of Michigan for Amtrak operations. The line, which is the old Michigan Central main line, leaves the Detroit terminal at Town Line (Dearborn) and heads west through Wayne, Ypsilanti, Ann Arbor, Jackson, Battle Creek, Kalamazoo and Niles, rejoining the NS main line at Porter, Indiana (near Michigan City). In the Detroit terminal, NS jointly owns the Conrail Shared Assets are along with CSX. Both NS and CSX use these lines to reach Detroit yards and industry. Larger NS yards in the Detroit area are: River Rouge, Oakwood (Melvindale), North Yard (Detroit) and Sterling Heights.